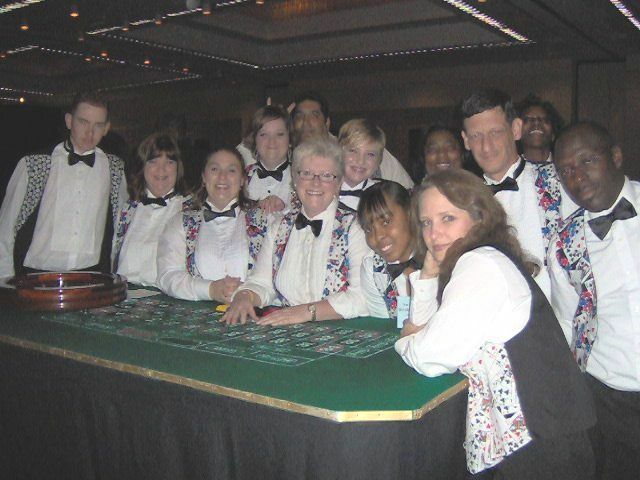 Gainesville Casino Party - Bring the excitement of a Casino Theme Party to your next event in Gainesville, Georgia. It's a sure way to get everybody involved. We carry all the popular games - Blackjack, Roulette, Craps, Wheels of Fortune, Chuck-A-Luck, Poker (including Texas Hold 'em), and Baccarat. In addition, we also offer video horse racing and table top horse racing. Whether it’s a corporate event, fund raiser, birthday party, or any other type of special event, a Gainesville Casino Party is the most interactive and fun event you can have. No matter what game their playing, your guests will think they're in their favorite casino, winning thousands of dollars and having the time of their lives. More choices - we offer full-service casino parties, table rentals only, and every choice in between. Better prices - we cut out the middleman. Unlike most entertainment agencies or agents, we own all of our casino equipment. Without the middleman, we are able to charge reasonable rates for our services. Many times, our clients ask why we were lower in price than our competitors. It’s because many of our competitors don’t own their equipment, and sometimes mark it up 100%! Since 1985 we've been providing entertainment and putting on parties for all types of organizations. So, when you’re looking for a Gainesville Casino Party, make your next event a Funtastic one! Here is our Casino Party Planning Guide.